It is not your typical funeral cortege - a coffin, a wheelbarrow and a concrete mixer, all three carried atop a vintage 1950s flatbed truck. On Wednesday, builder Gwynfryn Watkins will make his final journey to a church in Llanharan, Rhondda Cynon Taff, in unique style. But the funeral procession will not only be a celebration of the life of a skilled builder. 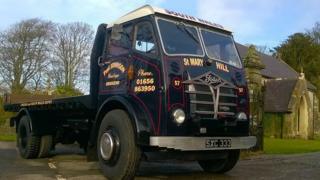 It will also showcase the painstaking restoration of a 1957 FG Foden lorry. Geoff Smith, 60, is a vintage engine enthusiast from Bridgend. The lorry was a labour of love for him, and he has spent the last year transforming it from a wreck to a fully working engine. Mr Smith never intended to start a specialist hearse service. It was only a chance meeting with a funeral director at the Malvern Show, where Mr Smith was displaying the lorry, that the seeds of an idea were sown. Mr Smith said: "To this day I don't know his name, but he said to me that it would lend itself to an alternative hearse. So it's all thanks to him really. "I know I'm biased but it really isn't your everyday vehicle." Mr Smith, who runs a mobile clothing stall with his wife, worked on the vehicle alongside their three foster children. "Our three children are 11, 12, and 18 years old," he said. "The two little ones are very interested in old vehicles and we have worked on the lorry together. It's really helped to turn their lives around." According to funeral directors Mel and Ron Watkins, who are based just outside of Bridgend, companies are starting to offer a wider range of transport options to match the personality of their loved ones. "It's not unheard of - we get tractors, horse drawn carriages, all sorts really," the firm said. "Especially if the deceased was a particular tractor fan. We once had someone carried in the front loader of a JCB." Foden is one of the longest surviving truck manufacturers in the world. Mr Smith first saw the lorry at the Dorset Steam Fair and was so taken with it, he asked the owners for first refusal should they ever want to sell it. He did not think any more of it until he received a phone call out of the blue from the family. Unfortunately, Paul Johnson, who owned the vehicle, had died aged only 30, and his parents wanted to sell it. The memories of their son are still raw and the lorry is a painful reminder of him. Both in their seventies, they said: "We just wanted it to go somewhere where it would be appreciated and used." In honour of Mr Thompson, Geoff has added a plaque in his name on the cab door. Mr Smith is now offering the lorry for other funerals through his Classic Foden Lorry Funerals service. According to Mel and Ron Watkins, families have requested a vintage lorry before, and they have had to source it from a company in Gloucester. "Now that Geoff is offering his, and he is based locally, that works really well for us," they said.